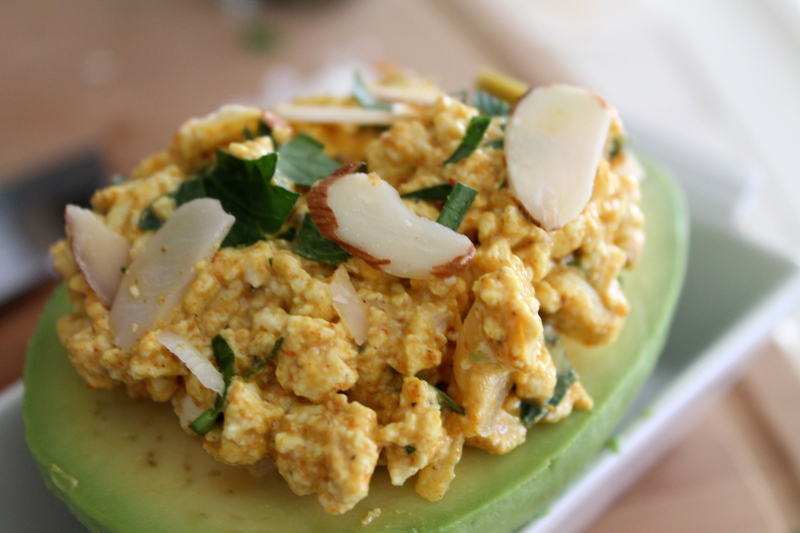 Listen, the fact that my title says egg salad makes me wince. I get it. It’s a food with a bad rap. But this egg salad is free of sulfur-smelling ingredients and could even be called “elevated,” which is just another way to call food fancy. Much like “deconstructed” dishes somehow make things cost $10 more — you know, cause the chef didn’t have to assemble it. This dish was another brainstorm of my friend Annie (see Baked Pears). 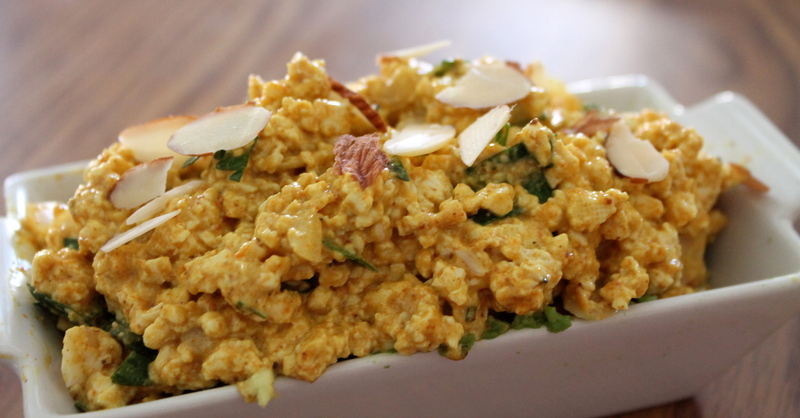 She said she gets a curried version of tofu “egg” salad from Whole Foods that she adores and asked me to recreate. Without knowing what the Whole Foods version looks, tastes or feels like, I accepted the challenge. And the result is a beautiful thing. 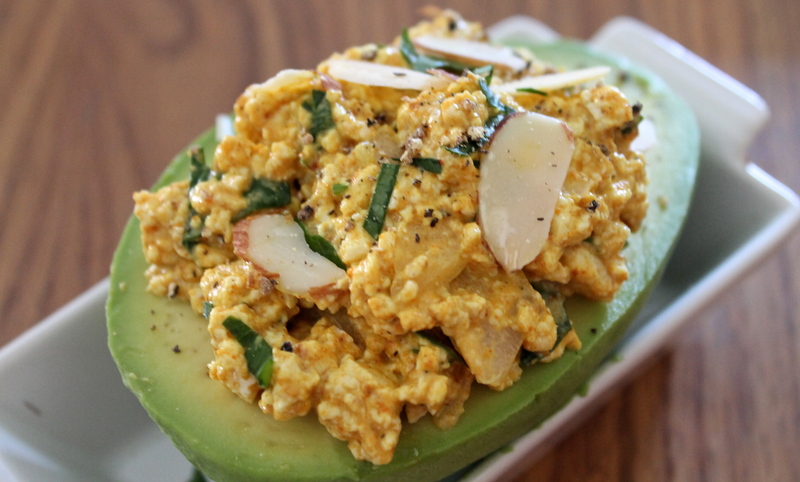 Who knew crumbled extra firm tofu had the exact same consistency as eggs? Whole Foods did, friends. Whole Foods did. 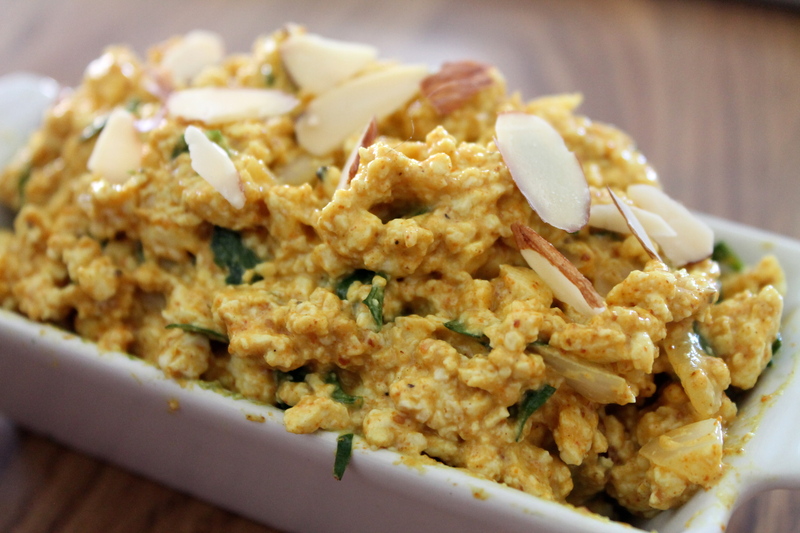 I used yellow curry powder, my charismatic condiment, vegan mayonnaise, onions, parsley and sliced almonds for crunch. And then I stuffed it inside an avocado because it looks prettier than bread and tastes better, too. 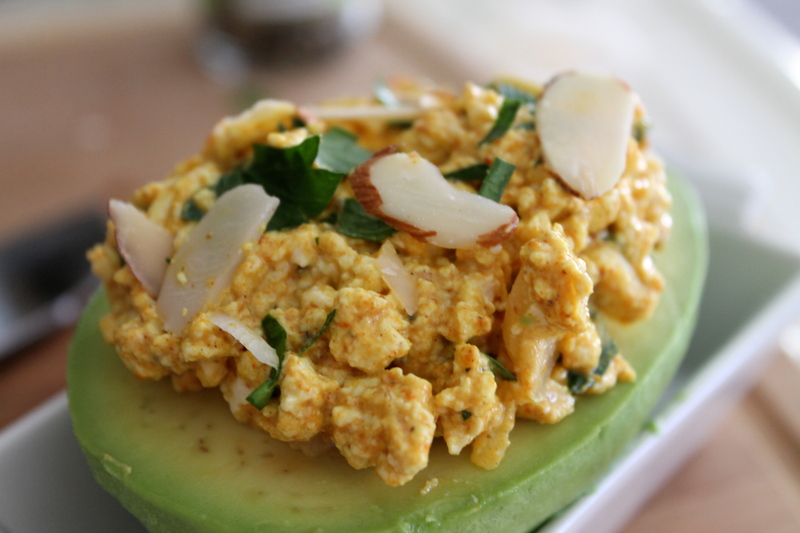 While the texture may be reminiscent of egg salad, the flavor is far superior. I could get used to eating vegan. Drain the tofu and wrap it in paper towels, setting a heavy pan on top. Let sit for 20 minutes, changing the paper towels once. 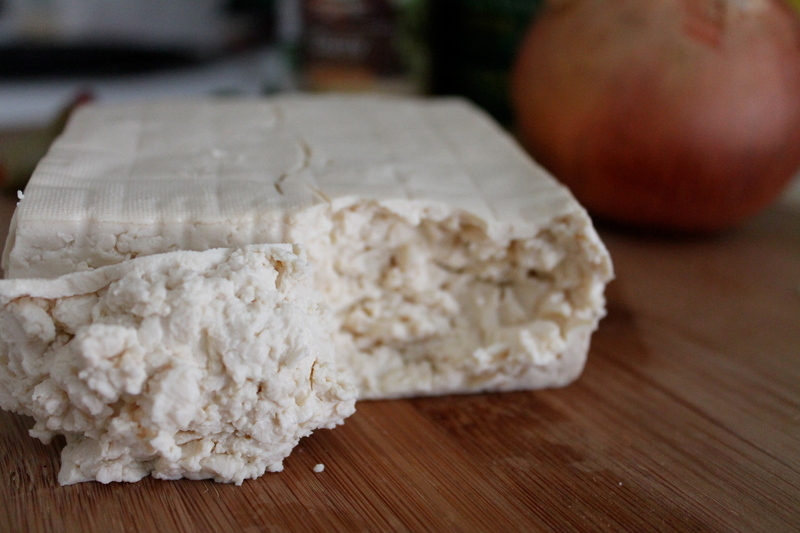 This will dry up the excess moisture and allow the tofu to crumble more easily. 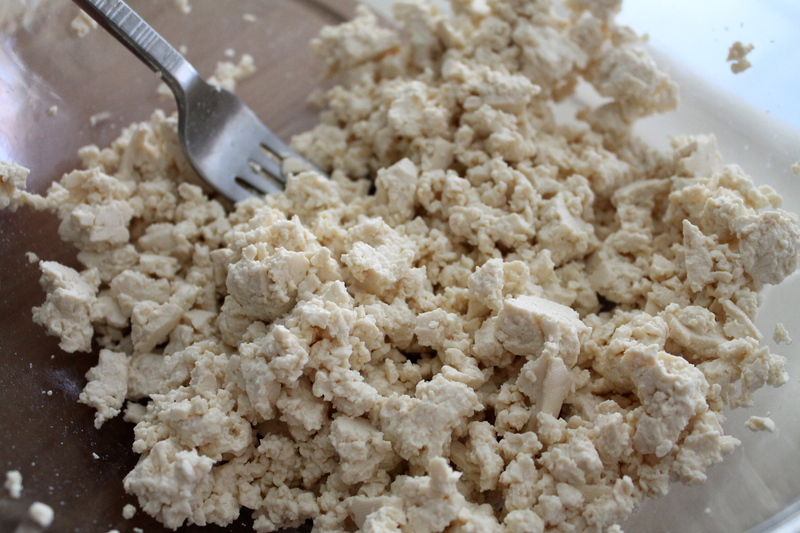 In a large bowl, crumble the tofu block with a fork until it reaches an egg-like consistency. 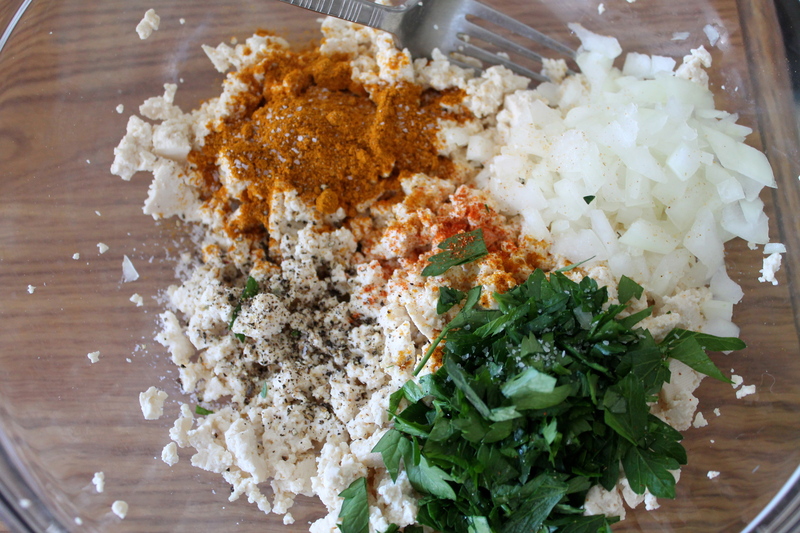 Add the curry, salt, pepper, parsley, onions and cayenne and mix. Add the mayo and mustard and mix again. If you like your egg salad more creamy, feel free to adjust the vegan mayo and mustard amounts. Fold in the sliced almonds and refrigerate for an hour before serving. 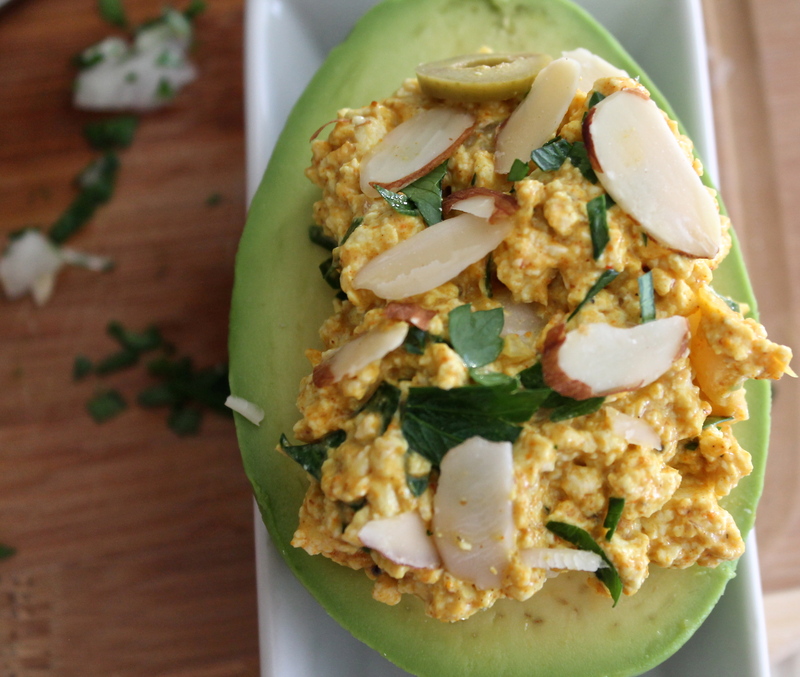 Serve inside one half peeled avocado halve and enjoy! Add chopped green olives on top for some acidity. Add golden raisins for a sweet balance to the smoky, spicy curry. Don’t like onions? Add some green onions instead of parsley so you maintain the color but get a more mellow flavor. Pulse the tofu in a food processor to easily chop it up. 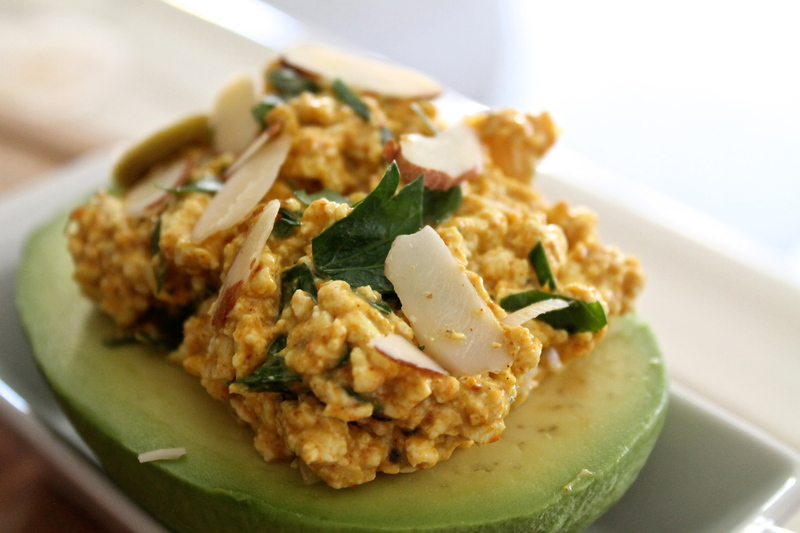 Serve on top of a toasted pita or whole grain bread (if you aren’t vegan). Serve on a bed of butter lettuce with sliced tomatoes. Hello there! I simply want to offer you a huge thumbs up for your great information you’ve got here on this post. I hope the curry helps, not a big fan of tofu but this looks gooood! Great simple recipe–and the photos look delicious! I like how you listed variations at the end. Olives! Divine! 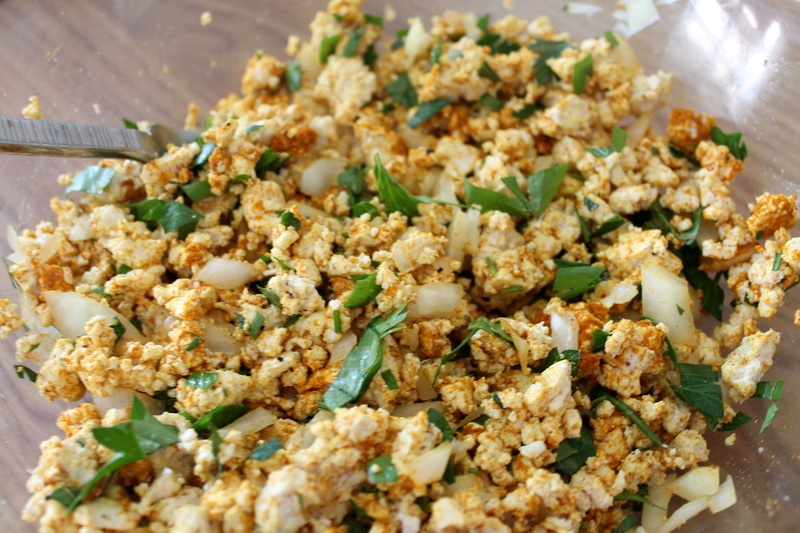 Tofu scramble can be abit bland so I love your idea to add curry flavours! I agree. Tofu is a tough sell because if its blandness, but the curry melts in nicely to it, infusing the stuff with spicy goodness. Thanks for reading!